Most often you will have carpet on your stairs, and you need to remove it first. It can have tack strip and a lot of staples. Be careful pulling the carpet off because the staples are very sharp. Its best to where gloves. 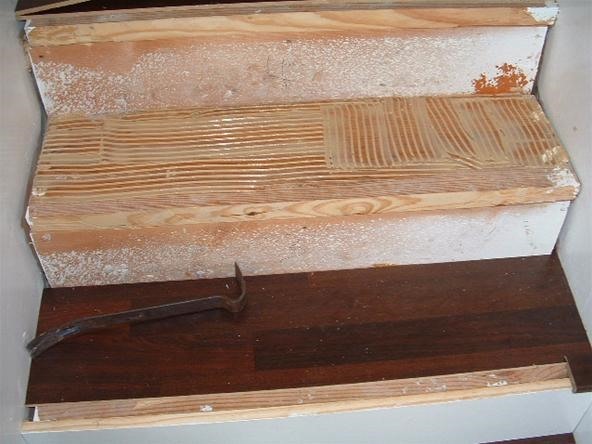 Use a hammer and pry bar to remove the tackstrip. If you have an over hang you can either remove it or fill in the space under it so the laminate flooring can be installed. When purchasing your laminate flooring you will need to purchase stair nose moldings also to have an over hang with the laminate. 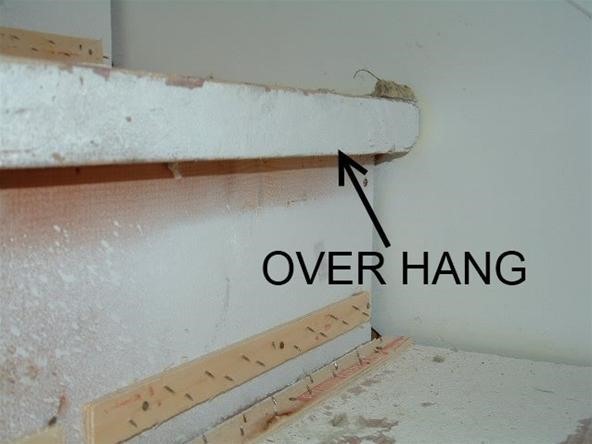 There are a few different ways to cut the over hang off the stair. Using saws such as a sawzall, Skil saw or even a jig saw can work. In most cases one laminate plank will not cover the whole tread. It is better to cut two planks the same size to fit the tread rather than using a whole plank and a small strip. The other thing to consider is, the sides of the stair case may be at a slight angle. If this is the case the tread will need to be cut at this angle so you don't have unsightly gaps. When cutting the laminate treads getting the exact measurement across the width of the stair is important. Cutting the risers are like cutting the treads, the difference is the riser is vertical. In the case a white painted riser is being installed. You can also use the same flooring for the riser as you use for the tread. The riser may not be square to the wall on the sides so you may need to cut them at a slight angle to fit even with the sides. You can use a simple angle finder and transfer the angle to the riser. After cutting the riser to fit side to side, you will need to scribe the top of the riser so it is flush with the surface the new tread will be installed on. Cutting the stair nose is just a matter of cutting it to fit snug on each end, and cut the ends to follow the angle of the wall if needed. 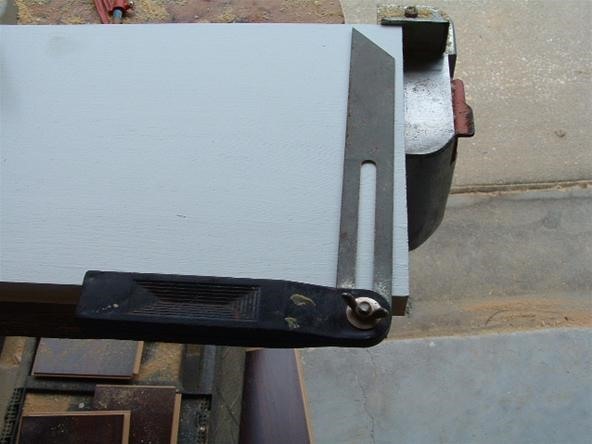 As shown in the photo you can see how the stair nose needs to rest on the riser which should be cut flush with the surface. I use wood glue on the treads with a notched trowel. Don't glue all the way to the front edge as this is where the stair nose will be attached with a different type of glue. I use a heavy duty construction adhesive to glue the stair nose with. I also nail into the stair nose three or four nails across, not too close to the edges. Use a matching putty to fill in the nail holes. Here is the end result a nice looking stair. 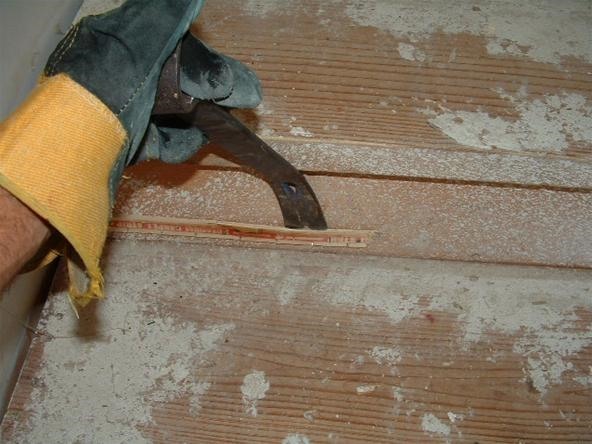 As you cut each part of a stair, mark the part and the stair it will be attached to. Use a nail gun and nail where ever possible so the nails are hid. 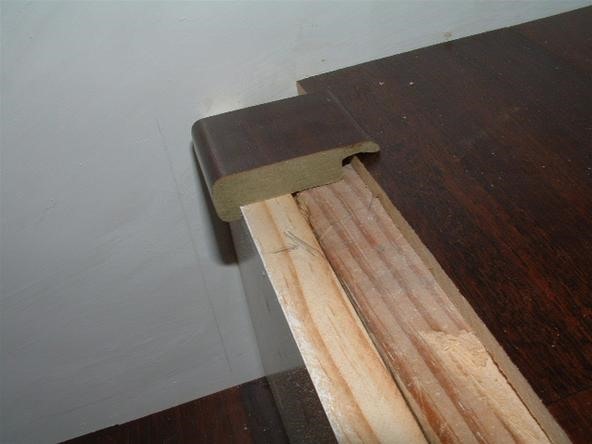 It is better to nail and glue the stair nose to insure it is secure. Taking your time is going to give you better results. Always use proper protection when operating power tools. did u end up sanding and staining the oak railing? Is all I did was install the laminate flooring on these stairs. They just happened to pick a flooring that matched the railing pretty good. As you can see how difficult it is to laminate staircases of your house. A slight mistake can damage your staircase or even can cause serious accident. So, it must be done by professionals who are expert in this kind of business. Top Flooring Toronto is one such company which do high quality staircase lamination & the cost will be within your budget. Hi John, Its good to hear from experts that take pride in their work. It sounds like you pay a lot of attention to detail. Keep up the good work. And I hope you get a lot of business. Doesn't cutting the laminate leave rough edges? Do you put moulding or some other edging on stairs? i have the over hang but i cannot cut it out or fill it in because its making my step too small. what do you suggest? 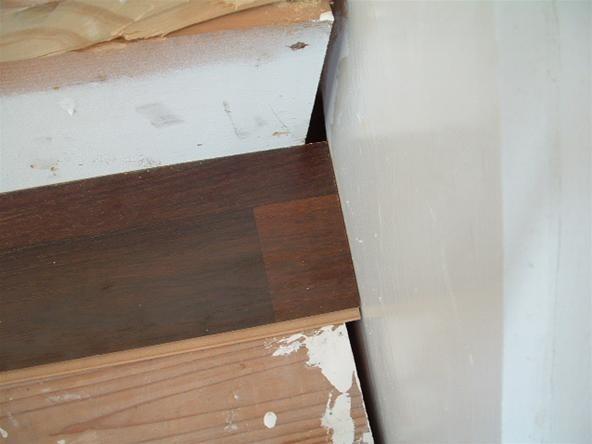 where you are installing your stair nosing, it looks like the laminate flooring does not have any underlay underneath it. How would you install the nosing when the flooring is on underlay (ex. foam) but you want to glue the nosing to the wood underneath? You do not use the foam underlayment on the stairs. 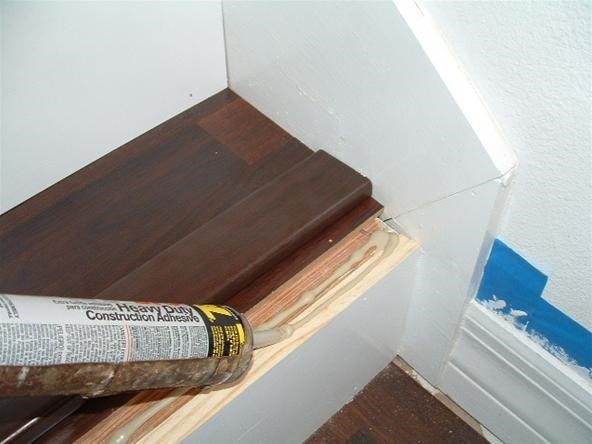 Glue your laminate boards directly to the stairs. The problem with this method is by removing the overhang or filling it in with other material is your shorting the steps by about two inches, and for someone with regular size feet that could be a safety hazard. No you're not... say you cut off 1 inch of overhang. 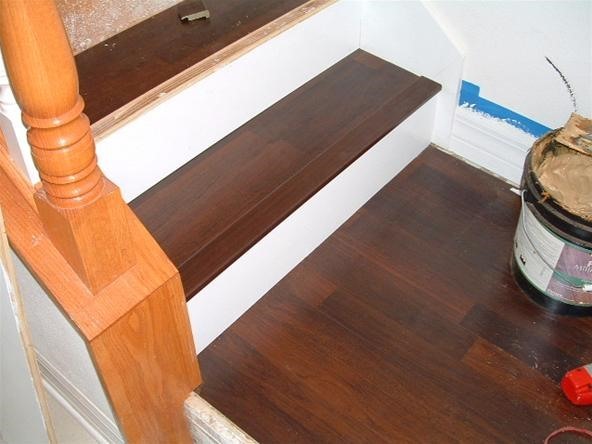 Adding the riser at whatever thickness wood you want as well as the bullnose on the stair would essentially put the stair depth right back where it was. It clearly shows the riser filling the space removed by cutting off the overhang. The stair depth won't change as long as your riser fills that space. It's all about aesthetics, you don't want to see anything on the underside except the stair nose clean against the riser. How do I extend my stairs to make them deeper? I currently have 9" deep floors which includes a square overhang. I would like them to meet the safety standard of at least 10". How do I extend my stairs to make them deeper? I currently have 9" deep floors which includes a square overhang.